Nui is brand new to Warm Heart. She completed 5th grade before arriving. She brought us her report card, and we can see that she is a hard working girl. She enjoyed Health and Sport class, as well as learning about Buddhism and Technology. We welcome Nui and wish her luck in 6th grade! 2.8 in 5th grade. Just for fun we asked our kids some questions. Below are Nui’s answers to some of the questions. My favorite food is pork. Nui Nuttayanee comes from the original Karen village of Mea Soon. Her identical twin sister Nuey is so alike, it’s hard to tell them apart sometimes! Everything from their clothes, to their hairstyle, to their names are similar. Nui likes most to hang out with her school friends. 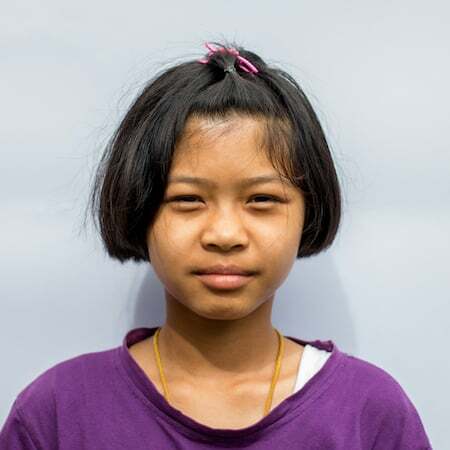 In fact, she enjoys school so much that she hopes to become a teacher after she finishes her studies! Although she’s still not sure what age group she would like to work with yet.